Many popular and classic mixed drink recipes start with a simple syrup. Using a sugar syrup is preferable to waiting for sugar to dissolve in cold liquids. This sweet blend can be used at once or stored almost indefinitely in the refrigerator in a tightly sealed glass container. Place sugar and water in a saucepan and bring to a boil. Reduce heat, stir to blend and simmer gently for about 5 minutes until sugar is completely dissolved and a syrup is formed. Cool. 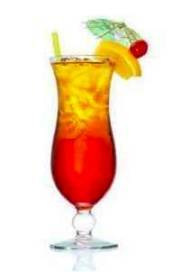 Mixed drinks are of course a mixture of various alcohols plus tasty ingredients and flavorings such as fruits, juices, creams. A stirred drink begins by putting the ingredients in a large or tall glass with ice. Gently stir. Strain or remove the ice if desired. Pour into a serving glass and enjoy. Stir mixed drinks when you are using alcohols and flavorings that are thick and syrupy such as triple sec, sugar syrup and fruit filled. Most alcohol does not easily blend with juices, syrups or cream. The best way to get the party started is to use a cocktail shaker to create tasty mix. Cocktail shakers come in a large variety of shapes and sizes. They are all composed of a metal or glass base container, a top and a separate or built in strainer. Partially fill the shaker with ice and pour the ingredients on top, alcohol and all. Place cap on top and shake, shake, shake for 15-20 seconds. Pour liquid through the strainer. Shaken mixed drinks are usually not served on ice. You guessed it, time to pull out the blender. Add fruit and other flavors, then alcohol and ice. Make sure to add fruit first to assure it gets finely chopped and pureed. **Bitters refers to an alcoholic beverage created from herbs, fruits, spices, and roots. It has a bitter or bittersweet flavor. Bitters are not meant to be consumed alone but are used to add a little kick to many classic cocktails. Bitters can also be used in cooking soups, stews and sauces. Combine ingredients in a glass with ice. Stir well and serve with or without ice. Pour bitters and water into an old fashioned glass (short and stout). Add sugar and mix well. Add whiskey and stir. Add ice cubes. Add juice from lemon twist and drop into glass. Garnish with an orange slice and cherry. Place six of the mint sprigs in a tall glass. Add simple syrup and **muddle the sprigs and syrup well. Add 1-1/2 ounce of the Bourbon and stir. Fill glass with ice cubes and add the rest of the Bourbon. Stir well and garnish with an orange slice, a lemon slice, and the final sprig of mint. Fill a glass halfway with ice. Pour grenadine and let it settle on the bottom of the glass. Mix tequila and orange juice in a separate glass and slowly pour in glass with ice and grenadine. Garnish with fruit. Combine ingredients in a cocktail shaker with cracked ice. Shake well and strain into a glass with ice. Fill a cocktail shaker with ice. Add liquors and lemon juice. Shake well. Strain into a tall glass filled with fresh ice cubes. Fill with cola. Garnish with a slice of lemon and a sprig of mint and serve with a straw. Mix all ingredients in a shaker. Strain mixture into a cocktail glass. Add ice cubes to a blender jar and pulse to chop the ice cubes slightly. Add the rest of the ingredients and blend until smooth. Pour into a tall glass or cocktail glass. Pour crushed ice into blender. Add Curacao, rum, pineapple juice, and orange juice. Blend until smooth. Pour into large glass. Garnish with an orange slice, pineapple chunk, and cherry on a toothpick.